Homemade pecan milk is so delicious and easy to make! 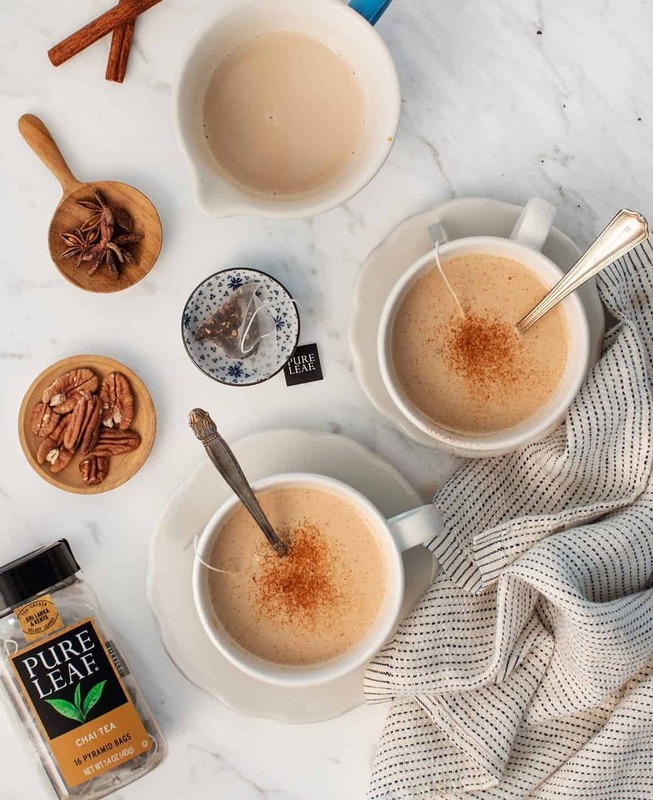 This dairy free nut milk creates the perfect fall vegan chai latte. So, by now you all know that I don’t drink regular milk. 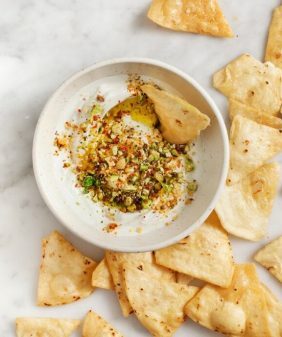 I do enjoy cheese occasionally, and I love greek yogurt, but regular milk… no matter if it’s just a little, it’s just not my thing (although, my entire family loves it and I’m totally fine with that – to each their own!). … strained it, and that’s it! Soak, blend, and strain! Store it in the fridge until you’re ready to make chai lattes. To make the lattes, heat up the pecan milk and steep it with Pure Leaf Home Brewed Chai Tea. To help enjoy fall to it’s fullest we’re giving away $50 Gift Cards for Pure Leaf Tea to 5 lucky readers. Leave a comment below telling me how you like to enjoy tea in the fall! Winners will be chosen at random, the giveaway ends on December 5th and is available to U.S. and Canadian Residents. 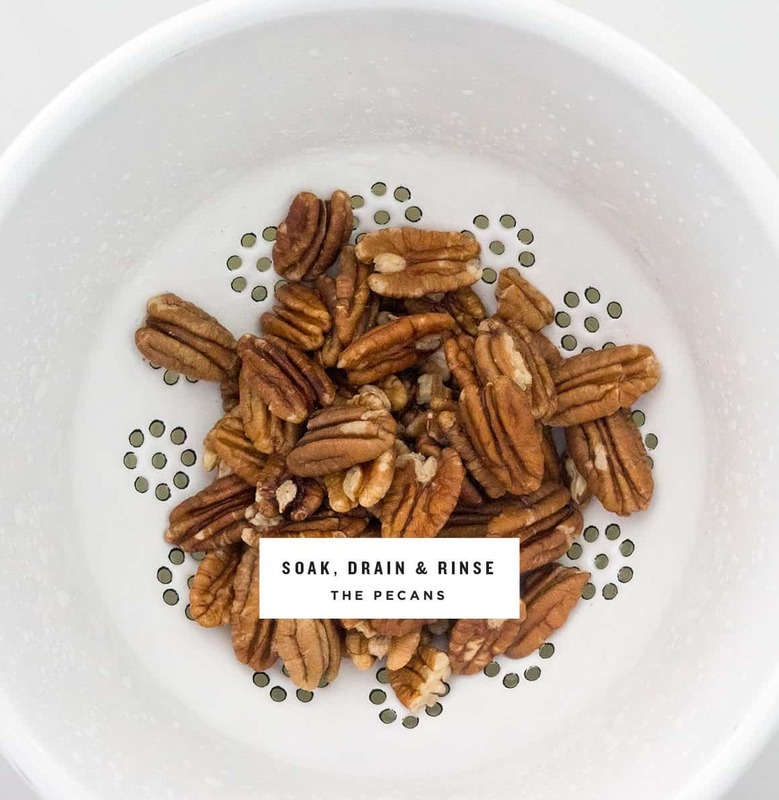 Make the pecan milk: Drain and rinse the pecans and add them to a blender with fresh filtered water, maple syrup, vanilla, cinnamon, salt. Blend until smooth. Place a nut milk bag (or cheesecloth or use a fine mesh strainer) in a large bowl and pour the liquid from the blender into the bag. Twist and squeeze the bag to strain as much liquid through as you can. Pour the strained pecan milk into a 33 ounce bottle and chill until ready to use. Make the lattes: For each serving, place one pyramid tea bag in a mug. Pour 8 ounces of boiling pecan milk over the tea bag and let steep for 3 to 4 minutes. Squeeze bag and remove. Dust with cinnamon, if desired. This post was created in partnership with Pure Leaf. I love to enjoy my tea during quiet, reflective moments, where I can collect my thoughts while enjoying the warming aromas of spice and tea leaf combined. Looks delicious and perfect for this weather!!!! This sounds amazing! Would love for you to stop by and link this up to More The Merrier Monday. Omg this post made remember how much I love Chai latte! 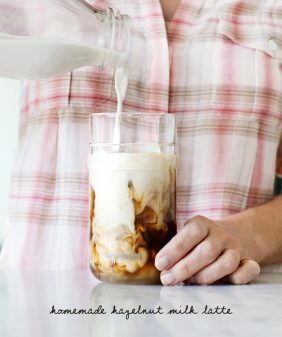 I’ll probably be making some tonight! What are the ratios for a single serving? 8 oz. pecan milk for each tea bag – the pecan milk recipe makes about 4 large lattes. There isn’t much better than a hot cup of spicy tea, a great book, and a cozy blanket on a fall weekend afternoon… and I live in Southern California! I love to drink tea in the early evening – I love when the days are shorter and lights go on early, and home feels cozy and just right. 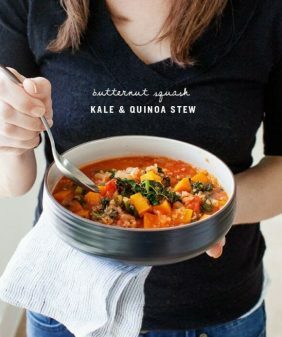 This looks amazing – I can’t wait to give it a try! Ps. Do you have any tips on how to prevent homemade nut milk from separating when using it in warm beverages, like tea or coffee? I loved the idea of using homemade almond milk for my lattes but could never find a solution to stop it from separating. Living in Portland Oregon, I’m loving drinking tea while it’s raining, sitting in front of a crackling fire with a good book, blankie, and soothing music. Nourishes and soothes my body and soul. This is just the recipe I was looking for. I love pecans and wanted something non-dairy that was like a hot chocolate! A warm cup of a healthy spiced drink soothes the soul and slows down my busy mind. This recipe will be my next drink to serve my women friends on our next get together. thanks for the new alternative! 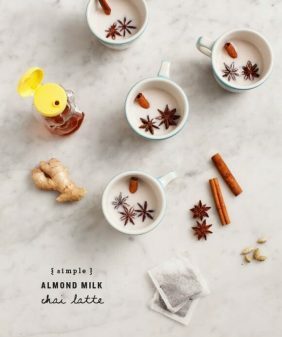 I love Chai tea Latte’s, but don’t drink milk— can’t wait to try this recipe, sit by the fire with a good book and enjoy the onset of winter! There is nothing like a warm spiced chai in fall to give me the warm cozy feeling of the season change and upcoming winter ahead. I love Chai the spices of cardamom, cinnamon, Ginger, and black pepper and I can only imagine how good the tea will be. I love this recipe and I think the pecan milk will be a brilliant change from my regularly made almond milk. Nice work! Do you know if pure leaf does a decaf version of this? I’ve never tried the Pure Leaf tea bags. In fact, I’ve only purchased and enjoyed the refrigerated Pure Leaf products. The recipe sounds delicious and satisfying, I look forward to making it! I love my tea scalding hot/basically still boiling, with a squeeze of lemon and a bit of sugar. Even better when I can add a good read and some candle light! I drink hot tea at my desk every morning while I work! Often with a little honey… because sometimes you need the splurge! Fall is the beginning of tea season for me. I make like 10 cups a day once the weather cools off! I like black tea with maple syrup and nut milk for breakfast, herbal blends throughout the day, and a nice decaf chai at night. I make almond milk quite often, but have never tried pecan milk. Sounds delish! I love drinking tea while I study and to unwind before bed. I’ve been enjoying ginger or raspberry leaf tea lately. I’ll have to try making chai tea with pecan milk sometime. It sounds yummy! I love my tea with a little kick *bourbon preferred 🙂 * for a super quick and cozy warm up! Don’t forget to use the nut puree in your next muffin baking! I’m not a huge tea fan, but in the fall and winter I love a big steaming mug of milky chai, with a shot of espresso if possible…! I grew up drinking tea with my grandma and still love enjoying a warm cup of tea while sitting and talking with her. I recently bought a Chocolate Chai tea blend and stopped at Penzey’s today for cinnamon sticks and whole nutmeg. Your pecan milk will be perfect with these! I like to sip tea in the evening, while working on a quilt for my granddaughter. Green tea with some honey mixed in! I’m a big fan of chai tea; but, I am also watching my calories. How many calories are in 8 ounces of Pecan milk? Hi Kathy, I’m not sure exactly. Since much of the pecan pulp is left behind, it’d be hard to calculate accurately. I switched to sencha green tea with a bit of matcha & honey which I enjoy each morning while perusing the NYT or listening to KUT/NPR. After reading your recipe, I’m excited to try my hand at making chai rather than buying the boxes of concentrate that disappoint! Thanks! Oh yum! I love chai tea and making it with pecan milk sounds amazing! I like to enjoy my decaffeinated herbal tea in an oversized handmade pottery mug snuggled up on the couch before bed on a cold winter evening. I’m an old hippie from long ago, but I just can’t seem to give up milk. There’s nothing like it. I tried making nut milks long ago. Still can’t turn my back on the cow. But i’m going to give this a try. As for chai, nothing in the States has ever beat street chai in India!!! I love sitting in front of the fire and reading while enjoying a cup of tea. I dry mint from my garden and have a cup of mint tea every morning while I sit in my favorite chair and read for a bit. As soon as it starts to get chilly, I love having a cup of tea every night while I read before bed. Oh homemade pecan milk sounds fabulous! Especially with all those cozy chia flavors. I’m ready to curl up with a mug! Love making my own pecan milk. I remember everyone thinking I was odd 6 years ago. Haha! Oh times have changed, thank goodness! These lattes look DIVINE! This sounds perfect for cozy mornings. 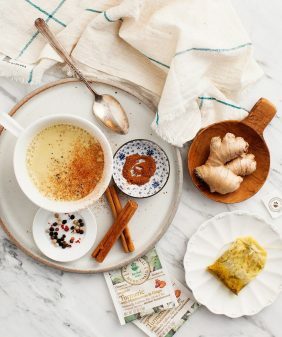 I love a vanilla tea that I jazz up with cinnamon, turmeric, a pinch of black pepper and a little bit of maple syrup for sweetness. If I’m feeling sick, I swap it for English breakfast (or similar) + apple cider vinegar, lemon juice, ginger and a little bit of cayenne! I’ll be honest, I’m a coffee drinker, but my DIL loves chai anything, so this caught my eye. I plan to make this for her! I love to drink tea in the late mornings and early afternoon. I usually sweeten mine with honey (if it’s a fruity or herbal tisane) or sugar (for black tea) and milk! I’d love to try your pecan milk! It looks delicious! I am obsessed!! I have (weirdly!) never had pecan milk, but that is about to change! I love to enjoy tea in the fall winding down after a day. Sitting on the sofa and talking to my husband or hanging out with our dog. This tea sounds amazing, I can’t wait to try making it! In the evening, writing a letter or listening to music…. I like to enjoy spicy chai in the fall but green tea is also a regular in my house. I love to enjoy tea (what kind depends on what time of day) while I’m on the couch, under a warm blanket, with a knitting project in hand. As soon at I get up in the morning, the ocean is ink black, so I fire up the stove. I squeeze half a lemon and make a warm mug of ‘citron presse’ to share with my toddler. (He squeals with laugher, “lemon juice!” By then, the teapot is warmed, and kettle has done its battle. Either two bags of Ty-Phoo, my favourite Orange Pekoe, or four teaspoon of locally made Earl Gray tea by Westholme Tea Co are tossed into my Blue Willow teapot. I always put a well instulated tea cosy on my teapot, which keeps my tea warm all morning. After preparing my little one’s mylk, I have a hot mug of tea. Together we see the ocean become indigo blue. For moments when my son gets out of hand, or I feel stress rising in my body, I pour a cup of tea and take a deep breath. My favourite use of pecan mylk this autumn was in a simple apple mylkshake. In the blender I whizzed 1/2 cup homemade applesauce/puree, 1/4 cup dates (5 Bam dates), 1 cup of pecan mylk and a pinch of salt. As nut mylk shouldn’t be heated too high, I’m thinking it would be best to make a pecan creamer, using two cups of water instead of three, then steeping strong chai tea with hot water in a tea pot, gently heating the mylk, and combining the two. I enjoy tea in the afternoon waiting for my kids to come back home. Peppermint, or green tea with lemon…either give me a little lift and provide a moment of pause so I can be most present for those important moments at home. Mmmm I enjoy all kinds of tea and can’t wait to make this pecan milk. I drink tea by the gallon all year round, but in fall, I definitely go heavier on the spices. Just a pinch of ginger, cinnamon, or nutmeg can utterly transform the plainest of tea leaves. It` amazing! I want to try it! This is a very creative recipe. I never thought about pecan milk. It’s normal since there aren’t any added stabilizers – just give it a shake before you pour! I really love drinking tea rather than coffee! I generally drink tea when I sit to study every night! It helps me to concentrate on my study! I can’t give your recipe to a try! Going to make it tonight. Thanks a lot for sharing. I love my tea HOT in the fall! 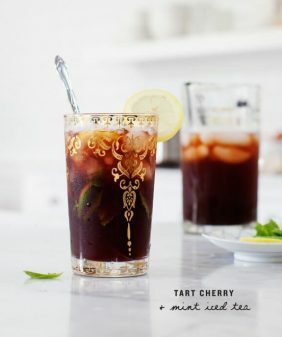 After a summer of all sorts of iced teas, warm tea is so welcomed. I keep a kettle on my classroom and my students always try to guess what type of tea I am drinking on any given day due to the scents in the room.